Familiar territory this, though not for some time. 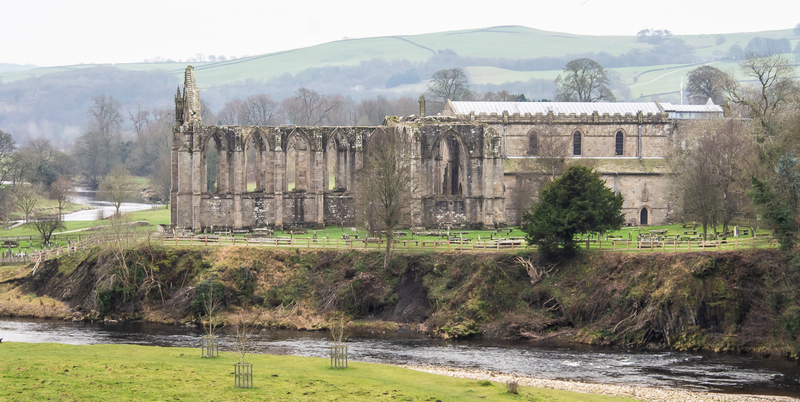 We parked at the Cavendish Pavilion (£10 per car) which gives access to the Abbey in one direction, the Strid in the other and across the river to the wonderfully named Valley of Desolation and the climb up to Simon’s Seat. I’d really like to do that walk again someday, but on this day it’s a fairly gently amble along to the Abbey ruins. It’s a seriously lovely stretch of river that the Abbey overlooks, and I find myself pondering, not for the first time, that the founders of these great religious houses knew what the were about. The stepping stones across the Wharfe immediately below the abbey are something of a tourist magnet; we took to the bridge that spans the water just a few meres downstream. The pictures show people enjoying the place, maybe not in monastic meditation, but certainly taking pleasure in this beautiful spot. Returns tentatively planned to sample once again the other two directions! That’s what stepping stones ….